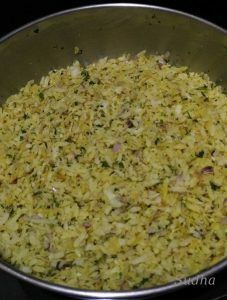 Poha / Pohe is flattened rice. This recipe does not require any cooking except for Tempering. It’s a quick, healthy and tasty recipe. Sometimes Turmeric Powder is not added to Dadpe Pohe. You can skip it if you don’t want it. 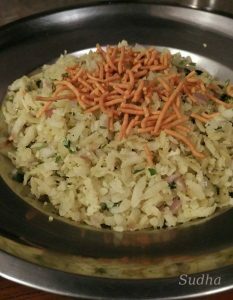 Generally Dadpe Pohe is made using Thin Poha. But You can also make Dadpe Pohe using (a) Basmati Poha or (b) Thick Poha. I’ve given instructions for all in the below recipe. 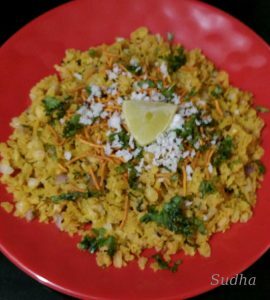 Since there is no cooking in this recipe, only precaution required is to check whether Poha is soft enough. If Poha is not soft, it will be chewy and that will not taste good. 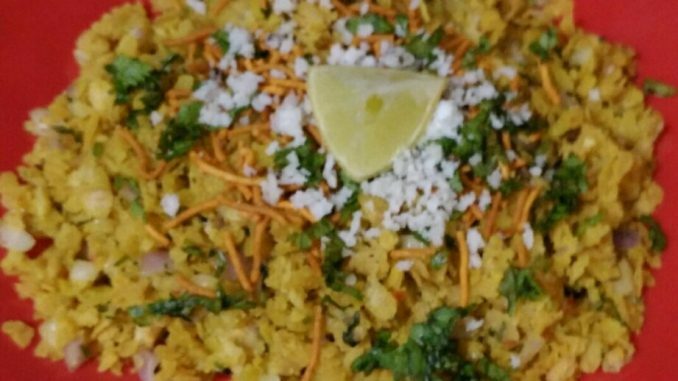 If Poha is too soft, it may become mushy. 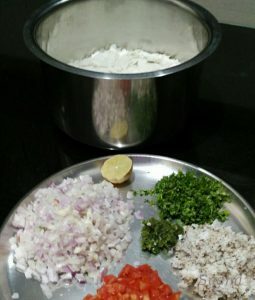 Poha will become soft if there is enough moisture in the other ingredients that you add to Poha like Chopped onions, tomatoes, freshly scraped coconut and Lemon juice. If the moisture is not sufficient, then sprinkle some water (or coconut water if available) on Poha and mix properly. This will make Poha soft. 1. (a) If you are using medium thick Basmati Poha then Do not wash poha. Sprinkle little water (or coconut water) on poha at a time just enough to make Poha soft. For 1 cup poha, you will require about ½ cup of water. (b) If you are using Thick Poha then wash Poha and drain water completely and let it rest for 10 minutes. Sprinkle ½ cup water (or coconut water). (c) If you are using thin (Patla) Poha, do not wash Poha. Do not add coconut water. Just follow next step. 2. Add onion, tomatoes, scraped coconut, coriander, chilly paste, salt, sugar and lemon juice. Mix well. 3. Prepare tempering using oil, mustard seeds, cumin seeds, turmeric powder, asafoetida (hing) and curry leaves. Let it cool for 5 min. Now pour tempering on poha and mix well. Dadpe Pohe is ready to serve. 4. Serve with coconut and coriander garnishing. 1. If you don’t like onions, you can skip it. Poha without onion also tastes nice. 2. If you want, you can skip Tomatoes. Increase Lemon Juice as per taste. 3. If Dadpe Pohe are dry, just sprinkle some water and mix. Pohe will then be soft. दडपे पोहे ही लोकप्रिय महाराष्ट्रीयन रेसिपी आहे. ह्यात तुम्ही फोडणी घातली नाहीत तर ही ‘नो कुकिंग रेसिपी‘ आहे. पण मी फोडणी घालते. त्याने पोहे खमंग होतात. मी फोडणीत हळद पण घालते. तुम्हाला नको असेल तर फोडणी घालू नका / फोडणीत हळद घालू नका. दडपे पोहे साधारणपणे पातळ पोह्याचे करतात. पण मी बासमती किंवा जाडे पोहे वापरून सुद्धा दडपे पोहे बनवते. ह्या रेसिपी त सगळे प्रकार दिले आहेत. दडपे पोहे बनवताना एकच मुख्य गोष्ट लक्षात घ्यावी लागते. पोहे पुरेसे नरम बनवणे. नाहीतर दडपे पोहे चामट होतात आणि खायला त्रास होतो. जास्त नरम झाले तर पोह्यांचा गचका होतो. ह्यात कुकिंग नसल्यामुळे पोहे नरम करण्याचा एक पर्याय म्हणजे जे साहित्य घालतो त्यातलं पाण्याचं प्रमाण – जसे कांदा, टोमॅटो, नारळ, लिंबाचा रस. हे जर पुरेसे नसेल तर एकच पर्याय उरतो तो म्हणजे पाणी (नारळ पाणी) वापरणे. हे पाणी कसे आणि किती घालायचे ते मी कृती त लिहिलेलं आहे. १. अ. जर बासमती पोहे वापरत असाल तर पोहे धुवू नका. पोह्यात अर्धा कप पाणी (किंवा नारळ पाणी) घाला आणि मिक्स करा. पोहे नरम झाले नाहीत तर आणखी थोडं पाणी घालून मिक्स करा. ब. जर जाड पोहे वापरत असाल तर पोहे धुवून पाणी निथळून घ्या. ५ मिनिटांनी अर्धा कप पाणी (किंवा नारळ पाणी) घाला आणि मिक्स करा. पोहे नरम झाले नाहीत तर आणखी थोडं पाणी घालून मिक्स करा. क. जर पातळ पोहे वापरत असाल तर पोहे धुवू नका; पाणी घालू नका. पुढची स्टेप वाचा. २. पोह्यात कांदा, टोमॅटो, लिंबाचा रस, नारळ, कोथिंबीर, मिरची, मीठ, साखर घालून चांगलं मिक्स करा. ३. एका छोट्या फोडणीच्या कढईत तेल गरम करून मोहरी, जिरं, हळद, हिंग आणि कढीपत्ता घालून फोडणी करा. फोडणी ५ मिनिटं गार करा आणि नंतर पोह्यांवर ओतून मिक्स करा. ४. खमंग चमचमीत दडपे पोहे तयार आहेत. नारळ, कोथिंबीर, शेव घालून खायला द्या. १. हे पोहे कांदा न घालता ही बनवू शकता. तसेही छान लागतात. २. टोमॅटो नको असेल तर लिंबाचा रस थोडासा जास्त घाला. ३. जर दडपे पोहे सुके झाले तर थोडं पाणी शिंपडून मिक्स करा.पोहे छान हवे तसे नरम होतील.